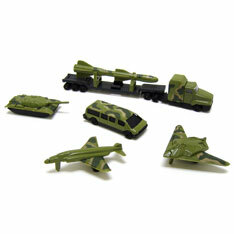 Emergency and Military vehicles in excellent details on die cast frames. Bright enamel colors. Boxed sets sold 6 pieces per set. Vehicles from 1” to 7”. $1.45 each for 72 or more. $1.30 each for 144 or more.